So, for those of you following along with the near constant drip of information pouring out of Games Workshop about 8th Edition, it won't have escaped your notice that the Galaxy Map has significantly changed since the last time we saw it. Not only are there domains of the Necrons included in glorious detail for the first time alongside the (long-standing) Tau domains, but there is a giant Warp Rift that has split the Imperium in two as it streaks from the Eye of Terror to the Maelstrom and beyond. Moreover, there are new warp tears in most segmenta of the Galaxy. So what is the cause of these new Warp intrusions? Of course, its a plot maguffin at some level. But what does it mean? Has the Emperor's will finally terminated somewhere and the light of the Astronomican failed? Has the ancient Eldar web way finally given up and daemons overran it? Or is it just that Chaos is generally rising everywhere? To me, it is a little bit reminiscent of something out of Dungeons and Dragons. Go with me here. 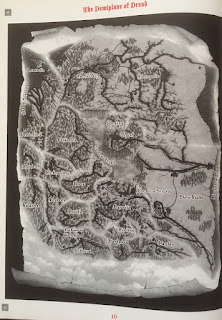 In the Ravenloft setting, there were strong and significant changes to the map as the editions evolved. 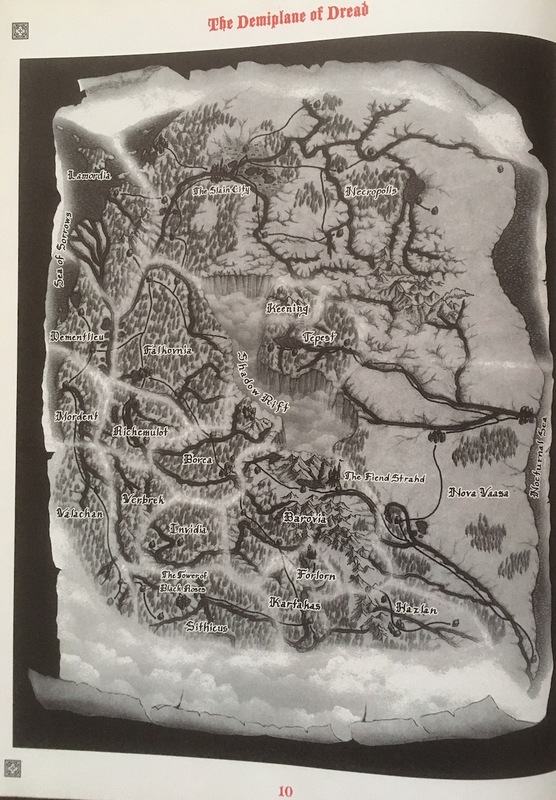 One of the most significant was the introduction of the "Shadow Rift" in the new arrangement of the domains of dread (it appeared in the book of the same name; the image shows its introduction). Basically: all the locations shifted around and a new dark realm erupted in the middle of the main map. It turned out to be a new "race" being introduced to the Ravenloft campaign (the shadow Fey). So do these new warp rifts in 8th represent the introduction of something even more malign in to the 40k universe? I don't think we're going to see the introduction of a new chaos power myself (unless there's a kind of Malal re-boot, or Slaanesh gets bested by the Ynnari or something), but hey, I've seen stranger and analogous things happen in other settings. And now I'm all curious about what it might all mean! CNC miniatures are an Australia based company that are now one of many who produce MDF based 28mm terrain. They have a wide range of products on their shelves now and I have been buying from them since I lived Down Under a long while ago. UK based analogues can readily be had from companies such as TTCombat, but I still have a soft spot for CNC to say the least. One of their recent products that I picked up were the Science-Fiction building range. I have a small bunch of these and this is just one of the range -- the administration block. The product comes in a sealed A4 set of three sheets. Fresh out of the wrapping, they have a characteristic "burnt" smell to them thanks to the MDF cutting process. (Fair warning to those of you out there with partners who don't like such odd smells around the house … just saying!). The parts are very finely lasered out of the MDF sheet. There are a few tags still attached to the sheets to keep them in the frame, but these are trivial to break and get the bits out. This is significantly different to the technology that they were using ten (or so) years ago where the tabs were very significant and required a hobby knife to set them free (much like modern GW plastics). These ones are literally push out style for the main part. The remaining tabs can be sanded down to be perfectly flat if required, but for the most part, I don't find that necessary. The final photo shows the reverse angle compared to the one at the top. All of the MDF has been glued together very easily with PVA glue and there are plenty of extras left over for any extra bits that one might like to add to this model or any other. The product is very sturdy overall and I'm very pleased. I'm uncertain if I'll actually paint them just yet (MDF notoriously absorbs paint readily and I don't really want to coat it in more PVA to provide a layer for it to stick to better) … I feel their current colour is actually well suited to the kind of terrain that I want -- a sandy based frontier world. But more on that particular terrain board at a later date once I've created more buildings for it. Cancellation. After much deliberation, we are taking the heart-breaking choice of cancelling the two day format Horus Heresy event in June. We will write directly to those people who are affected by this; at least no cash has changed hands at this point, so we wanted to make this choice early given the UK public holiday on Monday. The main reason for this is timing -- the dates simply didn't suit many external players. Thank you so much for your support in this event -- it has been very much appreciated. We will be replacing it with a 1 day format 40k tournament on June 3rd for anyone still interested, and may attempt a full two day format Horus Heresy event again later in the year (October in all likelihood, but to be decided). On a roll with the scenery at the moment, and with some old parts too. In the image below, you can see the remains of a very old computer fan. I have torn off the last remnants of cable and mounting (including screws) from the fan so that there is only the casing and the fan itself left. It is resting on top of some blue styrene cut to size. It is at this point that I made a stupid rookie error of judgement. Seriously, I am totally embarrassed to tell you what I did next. I got a can of chaos black spray paint and tried to undercoat it. For those of you not in the know, spray paint dissolves styrene, rather than coats it in a nice layer of paint. I could have kicked myself for this. How did I not remember that spray paint accelerant does this? Such a stupid move really. And one that I should have totally avoided. Please learn from my mistakes! Ha! Anyway. I did a rescue plan. I mounted four squares of cut plastic on each side of the remaining cube and glued them in to place with a generous amount of PVA glue and a few prayers to the modelling pantheon. It worked, by the edges really didn't look right. So I got hold of some drinking straws, sliced them up and fixed them to the corners of the mounting cube and painted them black too. The image below shows the final state of the computer fan cubes. I'll give them a bit more of a silver dry brushing, but they're basically done at this stage -- a terrain piece that blocks line of sight and looks very appropriate for a forge world style game board. Continuing a bit of a scenery theme, today some Shardwrack Spines. These are distinctly my favourite entry in the Death World Forest boxed set by a good margin. The reason for this is not only their design, but their comparative simplicity. The plastic effectively comes in two bits -- the bases, and the spines themselves. Many of the spines are one bit in and of themselves as they overlap with other spines poking out of the ground. The image below shows my completed set of Shardwrack Spines set on one of my more marsh / swamp like boards where I think they complement the background very well. The painting follows the theme presented by Games Workshop's painting team. The base of the spines are a dark brown colour, the lower portions of the upright spines are dull green, and the upper parts of the upright spines are a crimson red. These elements are blended together with selective use of inks and washes. Parts of the scenery have been dry brushed (particularly the base parts), and I've added some detail on the "spots" of the bark. I've no idea what these spots are supposed to be, so I picked them out in light green and orange. I think it works reasonably well and looks suitably alien. Just for completeness, the second image (below) shows the spines freshly assembled. There are limited spines involved, and I (accidentally) glued similar spines to both types of bases. If I get more of these dangerous plants, then I will certainly mix up the differently shaped parts more. In terms of dimensions, the spines are over twice the height of a standard space marine, and they provide reasonable cover … albeit dangerous cover. I wonder how they will work in 8th? I hope they're going to think about how the rules for scenery will interact with the new rules given that the boxed sets like the Death World Forest come with rules supplied for the scenery elements. A long time ago, I owned one of those "dig it up yourself" fossil boxes. If that means nothing to you, then consider this product: a plastic dinosaur that you have to assemble, that has been encased in a large blob of sandstone (or some kind of hard filler at any rate!) and you are given a scraping tool to "reveal" the skeleton of. It takes a serious amount of time and effort to get the skeleton out. I guess that is the point at some level though! And I've had this dinosaur model knocking around my bits box for literally years since I excavated it from its original confines. I then found that the bones sat nicely on some of the MDF cut outs that I owned from CNC miniatures. So, what is a guy like me to do with this? Well, the answer was simple. Re-encase in some limited amount of filler, paint it up, decorate with flock and add a couple of small, space marine sized trees around the edge. Hey presto and its done! A bunch of dinosaur bones scatter terrain that would look good on many grassy themed gaming boards! I am sorry to say that I didn't take notes (I was on public transport), but here are a few points from the 40k broadcast on 8th edition that I was listening to just now. * There is a rebate available if you've purchased a codex or rules book within the past 8 weeks (of the announcement of 8th). * 40k will get some Age of Sigmar'ing -- there will certainly be annual generals handbooks. * on release, there will be 5 (I think I heard that right) faction books available. There will be digital releases. * all current units and models will be playable. * don't stress about factions not being there on the 40k website at the moment -- they are still in. * there are 14 odd force organization charts available. more bonuses available for themed armies (perhaps even not taking allies will generate more bonuses). * each chart will generate different amounts of command points. * 3 ways to play (see Age of Sigmar). * TWO points systems: one for a very granular level (tournament play) and one for a broad brush stroke power level analysis (narrative play). * the current death stars may be a thing of the past -- the ability to spread bonuses to units will only affect units with certain keywords associated with them (see Age of Sigmar!). * no unit stat is capped at ten. * no armour values for tanks! I guess they will have wounds greater than 10! * sped up gameplay -- 1500 pts in about 1.5 hours. * there has been plentiful playtesting and it is "very balanced". The FAQ for 8th Edition has been released today! Here is the Warhammer Community page announcing 8th Edition and here is the FAQ page itself. (1) The new format will follow the Age of Sigmar approach with matched play, open play, and narrative play. This seems good to me. (2) "The rules in our current range of Warhammer 40,000 codexes aren’t compatible with the new edition of Warhammer 40,000. These books will be going off sale very soon. If you do want to pick any up, now’s the time - as all of the great hobby content and background information will be as valid as ever. " There goes all the codexes! (3) There will be annual "general's handbook" expansions like Age of Sigmar. (4) No exact release date as of yet. Imperium => Space marines, blood angels, dark angels, space wolves, grey knights, deathwatch, astra militarum, adepta sororitas, adeptus custodies, sisters of silence, adeptus mechanicus, imperial agents, imperials knights. Chaos => Chaos daemons, chaos space marines, death guard, thousand sons. Xenos => Craftworlds, harlequins, dark eldar, Ynnari, tyranids, genestealer cults, orks, necrons, tau empire. So, what happened to the other named chaos forces then? Lotus pods are an amazing product of nature. If you've ever seen some weird photoshopped images on the internet of skin with crazy holes in it, then its probably a lotus pod blend that you've been looking at. More than this though, lotus pods are a great source of inspiration for gaming and scenery modelling. They're cheap enough to buy in bulk too and readily available from vendors such as Amazon. Although being a natural product, you will have to check out if they are available in your own country (or for import to your home country) before you place an order. They come dried out but are reasonably sturdy. However, if too much pressure is applied, they can snap and break, just like and twig might do. I decided that I wanted to use my lotus pods to try to create some alien-like plant life. To do this, I used an MDF base and mounted a pair of pods on to it using nothing but hardware store filler. The filler was then painted using a graduated orange to brown colour scheme to blend in from the lower reaches of the filler to the upper parts of the lotus pod. The overall effect is one that does look distinctly alien (even without the use of tyranid parts … which is very tempting to add the odd hive tyrant style pincer or two to a single lotus pod … or even some ripper swarm members inside one of the holes along with some goo or red blood perhaps). A scenery experiment from me today. I wanted to use the skull tower from the Warhammer Magewrath Throne set for something a bit different from the throne tower (as I've not a clue how wizards are supposed to get up there anyway). The idea of using it for a water tower popped in to my head when I made an impulse purchase of some water-like acetate sheet (usually used in fish aquarium displays). After constructing the tower and painting it (white undercoat, brown wash and screaming skull highlight layering), I cut up a portion of the water sheet and glued it in to place. Around the edge, I sealed in some flock and general greenery using some superglue. From the top, it really has a kind of holographic water appearance, whilst the side-on view looks convincing too and provides a solid line of sight blocking presence. The ability to make scenic trees (and in bulk) is one that is shared by both railway enthusiasts and war gamers alike. I have personally been making trees for the hobby for decades. One of the most famous methods is to use lengths of wire and to twist them in to tree like shapes before coating them in some kind of putty or filler. The full details of that tutorial can be found here. Today, I wanted to share with you all a tutorial for a different type of tree. This is a method that I've only just refined for myself after a bit of experimenting around with various different techniques. I wanted to try to create a new type of tree that looked physically different to the wire mesh approach that I am very much used to. The other factor is that wire mesh trees - whilst they look fantastic when done well - can be fragile in transportation (or at least deformable if they're not packed away well). Hence I wanted to try to create something a bit more robust. Plus a type of tree that would do a bit more line of sight blocking if at all possible. This is what I've come up with -- a chunky tree that really does block lines of sight, and is relatively simple to construct in large batches at once. * PVA glue and some paint. The first step is to take the wooden dowels or wooden sticks and to sharpen one of their ends. I used a standard pencil sharpener for this. Using a knife to whittle it to a point also works. The point does not have to be sharp -- in fact, it preferably should be rather blunt if I'm honest. That done, glue a washer on to one of the bases and then glue upright the sharpened sticks in the middle of the washer, as depicted in the image. The washer is really there to give the structure some weighted stability and a low centre of mass. The downside of this is that the washer and the lower part of the stick really doesn't look much like a tree at this point. Hence the next step is to create something a bit more trunk like for the lower part of the tree. This is done by using the filler and drawing it up the wooden stick using finger tips to create a rough appearance and some potential root-like systems showing through. At this point, it is really important to leave this structure to dry out completely. Overnight preferably. Whilst the main tree trunk is drying, the foliage can be prepared. This is done by slicing up the sponge in to rough circles. Make sure the height of the slice is no more than 2cm, and then make some incisions around the edges to create a rough and random appearance. Next is the very messy step. Take the PVA glue and pour some in a plastic container. In the image below, I've used an old margarine tub to do this in. Mix in to the PVA some water -- I find that roughly 2 parts PVA to 1 part water works nicely, as does a 50-50 mixture. Add to the mixture some paint. The paint may not (and need not) dissolve fully, but that works nicely to coat the cut up sponge in to a variety of different colours. I've used greens, brown, and splotches of red and black to boot. Dip the sponge in to the PVA, water and paint mixture. I've used a very attractive rubber glove to do this with as can be seen in the pictures. Wring the sponge out as much as possible, but do try to retain a good amount of PVA and colour in the soaked sponge. Repeat lots of times and leave the sponges to dry out. Overnight preferably! Note, this will create quite a stink when drying out, so if you live with other people, at least warn them, or do it on a day / night when they're out. Just saying. In the image below, a variety of dried out sponges can be seen. They've all been hacked in to odd looking shapes (roughly circular though) and a variety of colours. I've also kept some of the notches that I've hacked out of the circles to use as the top of the trees (see the centre of the image). Once dried out, push the cut up sponge segments down on to the sharpened sticks. Glue them in to place with more PVA glue. Layer up two or three different sponge slices on to the sharpened sticks and rotate them to an aesthetically pleasing angle. Try to match up the lighter and darker colours on single trees so that they look more natural. Top off the tip of the tree with one of the smaller slices to disguise the sharpened tip of the wooden stick. Leave the PVA to dry and you should have something like in the picture below. The only thing left to do is paint the lower reaches of the tree. I've used a brown base coat (its actually textured paint) and then just dry brushed with a lighter brown colour to give the appearance of the final tree trunk. Done a few times over and you will end up with a small copse of trees or a mini-forest. The clear advantage of this approach is that these trees are nowhere near as delicate as the wire mesh approach. From a distance, they look fine. Close up, I'll be the first to admit they can look `blocky' if you've aligned them too well, or don't have enough variation in the sponges. Yet, they will look good on almost any battlefield that calls for trees and foliage for cover saves. His brothers might have subconsciously used the warp to hide in plain sight, or channeled it in to sheer unadulterated aggressive power, but Magus himself was able to play with it as if it were his own special toy. This is reflected in him being a level 5 psyker on the battlefield and arguably one of the most powerful psychic individuals in the galaxy alive at the time of the Heresy alongside his Father, His Father's right hand man, and perhaps a certain Eldar figure. In Inferno, Magnus is portrayed as a multi-faceted figure who is interested in scholarship, learning, and well able to leave a (literal) blaze of fire behind him on the battlefield. He wanted nothing short of the future ascension of the human race in to a masterful psychic race. Naturally, these ideals were perhaps not the best ones. Magnus has a terrific number of playable strengths. As the sire of the Thousand Sons, his sons may use his Leadership value in many situations, and he grants a re-roll of reserves if the desired result does not happen. He can unlock Sekhmet and legion terminators as troops to boot as well. He comes with psychic bonuses as one might expect. He doesn't "perils" as frequently as others do (and if he does, he doesn't suffer the worst of it). He harnesses warp charges on a 3+ to ensure that stuff happens when he wants it to. He can see through walls to target his powers (nice!) and his psionic attacks always ignore cover. Beyond this, his Mind Wrath special rule gives a huge boost to the strength of any witch fire powers, +2d6 S, with Destroyer hits indicated for 11+ in Strength. This means his psychic abilities are truly deadly on the battlefield if he is willing to risk a few more warp charges to make them a reality. His equipment is sound too. His armour is a nice 2+/4+ coupled with reducing the effects of destroyer weapons. His force blade comes with AP1 and a strength bonus to really shake things up in close combat. And he even has a quality ranged weapon with 1d3 assault at AP2 and S=8! Who cares about soul blaze when you have that? As if that were not enough, incoming attacks also suffer a penalty to hit him thanks to his phantasmal aura (that extends to any squad he also joins). He really does not have that many weaknesses. His attacks are arguably lower than some of his brothers, as are some of his other statistics. Watch out for being tarpitted. But he more than makes up for this by being a psychic monster that will dominate the psychic phase of the Legion (and the entire game in all likelihood as well). His points cost is surprisingly low -- lower than Horus -- for what he does. In this regard, he is a real steal. Run his as your Lords of War HQ and go forth to dominate the psychic phase. Take with you a command squad for fun, or a big blob of Sekhmet terminators as meat shields. Magnus is a single character wrecking machine on the tabletop that will take a lot to down him. Accordingly, he will also be a big target. Treat him accordingly and I have no doubt that he can win entire battles for you. Rumour has it that Amon was the first teacher that Magnus had on Prospero. His young pupil must have quickly exceeded his ability to teach him though. Interestingly, he must have also been an adult by implication when the Emperor found Magnus. Hence, his transformation in to an Astartes must have been different to other older people such as Kor Phaeron. Arguably, Magnus made it so. Amon has a bunch of interesting equipment that goes alongside his praetor-like stat line and level 3 psyker abilities. Unlike Ahriman, he generates powers from both divination and from telepathy, making him a bit of a more flexible prospect for a warlord. His armour is very nice for being able to share a cover save bonus to any unit he is attached to, as well as boosting his own cover save wherever he might be -- even in the open. He also keeps around with him a dust filled trinket from when the predatory psychneuein parasites were around. This acts as a one-off weapon that is poisoned and concussive. It can really help out in a tough melee as it hits automatically (1d6 or 2d6 depending on the number of opponents faced) and can turn a battle in to a victory readily. As if this were not enough, he is also an army buff, enabling re-rolling of seizing of the initiative and preventing outflanking in a huge bubble around himself. His reputation is therefore well founded. I don't think Amon has too many weaknesses. His warlord trait is a bit average (outflank an ordinary unit on a particular turn without a reserves roll), but other than that, he stands out as a good option for a warlord for the Thousand Sons thanks to his flexibility, his buffing, and individual potential on the battlefield. I see Amon as a very respectable warlord for the Thousand Sons. He is not quite a character that entire strategies can be built around like some, but he has enough special rules at a good points cost to be a serious contender for warlord for most Thousand Sons builds. Much can be said about Ahriman in both his 30k and 40k incarnations. One fact that people often overlook was that he was not a native of Prospero, but was Terran born instead. He therefore fought in the great crusade for neigh on two centuries before the Heresy. In the background, Ahriman is painted as one of the best pupils of the Thousand Sons ever. As a result, he is in charge of the Corvidae (the divination cult) and serves as the Chief Librarian to the legion -- the first and the last person to hold that role within the legion. Fundamentally, he is a level 4 psyker who generates his powers from divination. As a result, he is very talented, but also very focussed (some might say limited in comparison to what he will become in 40k!). Naturally, he is also automatically part of the Corvidae Cult. He comes with some master crafted equipment (force weapon and bolt pistol) as well as what might be expected of any praetor level character in terms of armour. And yes -- he is a master of the legion, should that ever be in doubt. I like the fact he has precision strikes as it is very fluffy. And like other 30k characters that appear in 40k, he has the Marked by Dark Fates rules in case you are playing narratively and need to roll for character injuries, or deaths, between games. He is not quite the go to HQ choice that he would otherwise become in 40k. To be honest, I see him in more of a classic support role for the Thousand Sons army. That is not to say that he cannot function as a warlord -- he most certainly can. But his warlord trait of giving scouts to a few units is nothing amazing overall. His ability to take a Corvidae command squad is interesting, but also nothing truly amazing -- just fluffy. I would actually favour Ahriman NOT being the warlord for an army. He can do terrifically well alongside someone else who is kitted out for the army, or perhaps Magnus himself. Placed inside a command squad, or a terminator squad, and given a transport option, Ahriman will do very well on the battlefield (especially with some of the divination powers under his belt) and can wipe away a lot of problems that the army might face on his own or with company. I just don't simply see him as the optimal choice for a warlord, that's all. I think there are better HQs. In the background, the Ammitara are painted as part of the Order of the Blind. A secretive and shrouded sect within the legion that was responsible for assassination protocols in tandem with scouting duties ordinarily associated with reconnaissance squads, they were a force that was often doubted to exist, even within their host legion. The come with sniper rifles as their base armament and gain the stealth, move through cover, infiltrate and scout special rules that sets them up very nicely at the start of the game. Shroud bombs continue this theme very nicely. What really sets them apart is their dedicated psychic power. As a brotherhood of level 1 psykers, they do not generate their powers as normal, but instead take a single dedicated power call Mind Killer. This is a blessing for 1 warp charge that allows re rolling of to hit and to wound, plus ignore cover. When it successfully goes off (and it should go off!) this makes the squad incredibly powerful on the board for long range sniping an assassination. The scout armour is the most obvious weakness here, in place of regular power armour. But given they should be in hard cover sniping from range, that's more than okay. The main problem here I think is whether the upgrades should be taken. The melta gun and plasma gun have fundamentally different roles to the sniper rifle, let alone ranges on the battle field. I think I would favour a plasma gun at 24 inch range, but its hard to want to take a melta gun here unless one can reliably get close to an enemy through infiltrating (etc.). The Storm Eagle as a dedicated transport is certainly a nice option here though. One can always take it and then infiltrate the squad anyway, setting up the eagle separately. A trio of builds to consider here. 5 Ammitara, Ammitara Fate with melta bombs and nuncio vox (150 points). This is what I think would be a flexible and baseline unit to have on the battlefield. 5 Ammitara, 1 Plasma Gun (145 points). An alternative baseline unit for infiltration purposes. The plasma gun can certainly benefit from the Mind Killer power here and be a real threat for a good points cost. 10 Ammitara, 2 Plasma Guns, Ammitara Fate with melta bombs and nuncio vox (270 points). Take with a Storm Eagle. You have the option to set up inside the Eagle, or to go it alone with infiltration and be maximally flexible here. Guardians of the Cults and warriors who combined their psychic potential with their own sword play. These are adaptable warriors and ones who have access to the full spectrum of abilities possible within the Thousand Sons. Two Force Swords used at WS=5 is a good thing for the Thousand Sons and may be a little bit surprising for some who are not used to facing Thousand Sons. What sets them apart is that the squad gets bonuses to both the number of attacks and WS beyond their baseline depending on how many marines are left in the squad. Clearly this calls for a maximum sized squad to begin with, and preferably mounted in a land raider of some flavour or other. I would prefer this brotherhood of sorcerers to have more psyker levels than one. Or be able to purchase them. But it is what it is. As a result, I would suggest that Pavoni is about optimal in terms of cults for this unit, with Pyrae a close second choice. There are not so many options here: extra members are almost a must, so it comes down to whether one prefers plasma pistols or hand flamers in place of bolt pistols. 10 Khenetai, 2 hand flamers, Blademaster with artificer armour and melta bombs (345 points). Probably about the best build available. Place inside a land raider and go hunting. I favour Pavoni with these marines. Hope to get Iron Arm, but the primaris is nice as well. The Sekhmet were a brotherhood within a brotherhood within the Thousand Sons. The fluff mentions that they were so unified that they were more like automata shaped in the likeness of men rather than the other way around. Illuminating for what they will ultimately become perhaps. Most obviously these marines are terminators (in any armour flavour you like) whilst being level 2 brotherhood of psykers. They all come with force weapons and combi-weapons with asphyx shells to boot. Plus they are stubborn. I think my main problem is that they can only have access to telekinesis and pyromancy as their disciplines. These disciplines are not the most powerful, but they are quality secondaries. This can readily be offset with the correct choice of Thousand Sons cult though. Generating warp charges on a 3+ is a huge boon, and that's before considering the bonus effects that they can have. That leaves the points cost. Give that these terminators have 2 wounds each, I think I would be very happy paying the points cost to gain the psyker abilities. Plus, they're probably going to be a half decent target for Alpha Legion Coils to boot. Very good value really when it comes down to it! 5 Sekhmet Terminators, 2 chain fists (275 points). A baseline mixed-thread units. Take with raptor cult for bonus to the invulnerable save and telekinetic powers. 10 Sekhmet Terminators, 3 chain fists, 3 power fists (475 points). Getting pricey now, but still worth it. This is a blob best used with their teleporters activated. Drop in place and have some fun. Take with Pyrae and tartaros armour to keep the sweeping advance. Take combi-plasmas to taste. 5 Sekhmet Terminators, 4 with lightning claws (255 points). Take with either Pyrae or Raptor and base out of a land raider. Assault for the win whilst being backed up with psyker powers. Blasphemous creations, these Castellax are fitted with psi-controller matrices rather than the standard cortex. They fill in gaps in the Thousand Sons legion's strengths given their low numbers and unwillingness to risk their own in otherwise nasty battles. They have all the positives that Castellax do: brutally large monstrous creatures with 4 wounds, T=7 and so forth. The mauler bolt cannon comes fitted with Asphyx shells for bonus effects. As if this were not enough, psykers from the Thousand Sons can use the Castellax as the point of origin for their psychic powers within 12 inches which is very nice indeed. There is a big drawback here. If a psyker suffers a perils of the warp within 12 inches (note -- not taking a wound, but just suffers a perils unlike the legion rules), then take an Ld test or suffer d6 unsavable wounds. And if it dies, it goes boom with the bigger radius possible. Whilst I like the Castellax, I don't see any need to upgrade them with aether-fire cannons. Hence I prefer to keep them "naked". In terms of numbers, a single one is fine, but several are probably worth the investment. Expensive, but when in range will do very well indeed. Keep them accompanied by a level 1 psyker (or brotherhood) for some psychic actions. Or how about a level 3 psyker if you feel like a riskier play? It could be very rewarding if you don't perils. Buy a litany. The Thousand Sons are painted as one of the more unusual legions within the pages of Inferno. We all know of the psychic potential (and potency), but more fundamentally, Magnus arranged the legion in very different ways than his brothers. The focus was distinctly at the squad level. These were arranged into Circles and Fellowships with other aspects (Cults, Orders) cutting across these. Then there is the whole Flesh Change issue that the book brings to the readers attention and how at various points the legion was shunned and distrusted, nearly extinct and booming. And how lots of them belong to the Dreaming Brotherhood -- placed in to stasis until a cure was found. My personal favourite bit of their history is when they send a mere 60 marines to bring a Knight world (planet 72-9) to compliance. They just stand in place, soaking up incoming fire with kine shields and then rip the pilots apart before telekinetically tossing the Knight's head back at their base. And thus they lost three marines; two to headache issues and one to being squished by falling debris. Magnificent! I regard the Thousand Sons as potentially superbly powerful and a highly tailored force that would even make the Alpha Legion cry with jealousy. Covenant of Sorcerers means that their warlord must be a psyker, and the one with the highest Ld score. In turn, this implies (at least until FAQ'ed) that it would be hard to impossible for most forces to take Thousand Sons as allies. Proserpine Lore gives psykers access to every discipline apart from Malefic, and the player can purchase psychic levels and Force weapons for their HQs at a price. Cult Arcana is the rule that sets them apart though. Each unit must select one of the cults (with compulsory troops possessing the same cult as the HQ). Psychic powers associated with the cult manifest on a 3+ rather than 4+ for warp charges. The cult grants bonuses (+1 run and sweeping advance; +1 invulnerable save; re-rolls of failed to hit rolls if stationary; adamantium will and fear immunity; or an extra hammer of wrath attach). These are very powerful and can be abused (combo-ed) to a huge degree. Naturally. The HUGE drawback is the Signs and Portents rule. And it is a BIG one. If a perils of the warp causes wounds, they think the flesh change is back. Every unit in the force takes an immediate pinning test. Your heard that -- every single unit. Death of all the independent characters causes every unit to suffer -1 Ld for the rest of the game and may no longer sweeping advance. Overall then, the Thousand Sons are an elite, expensive, infantry based force and filled with psychic might. Heck, they might as well just have two shooting rounding every turn thanks to the mind bullets that they're going to generate. On the other hand, they can become crippled with a couple of poor rolls. The more cautious general might like to stick to power level 1 powers for most units and characters. And/or purchase the arcane litanies. Finally, it should be noted that Praetors can (must) purchase psyker levels and the veterans and terminator squads have the option to upgrade to be a brotherhood of sorcerers. Arcane Litanies is almost an automatic purchase to get around a single bad perils of the warp for an independent character. Well recommended. Aether-Fire Cannon adds soul-blaze to plasma. Just not worth it really. I get the push for soul blaze, but not on these weapons. Asphyx Shells yield shred to bolters (ICs and terminators and veterans; or to rotor cannons for support squads). This is very nice indeed and worth taking. It makes rotor cannon squads in particular rather viable. Osiron Dreadnoughts can also be purchased as an upgrade to regular contemptor talons. For 50 points, they can have psychic powers, adamantium will, force blade and asphyx shells. Worth taking if you have the points realistically. The first rite of War, The Axis of Dissolution, is a bit situational to say the least. Bonuses to overwatch are nice, re-rolls against falling back enemies are okay, but the best bit is automatically passing pinning and morale checks. But only if they're on top of objectives. Having to take maximum troops is a pain though. The second is nicer: The Guard of the Crimson King. The players gets a bonus 1d6 for warp charge generation at the start of the psychic phase and the player can count the highest roll on this or one other die for harnessing powers. It gets that first power off nicely realistically. Allocating deep strike to terminators is great (of course) and causing fear when they arrive is just icing on the cake. However, Sekhmet Cabals have to be compulsory troops and Magnus may be purchased as the HQ. Fair enough. I see the Thousand Sons as mainly infantry based, albeit with rhinos everywhere to get them to places. They are also points intensive thanks to all the upgrades and psychic powers knocking around. Hence they are elite. But they're going to get effectively two shooting phases that should be taken advantage of. They should do well against psychic Word Bearer builds very well. I don't know how they'd find Eldar though. Applications are NOW OPEN. [...and a promo video made too!]. “Horus Heresy Reckoning” – June 3rd and 4th 2017. There are only 20 places available for participation in Horus Heresy Reckoning. [If successful, larger tournaments might be considered in the future!]. Since there are restricted places, we have an application procedure for players who want to take part. There are two types of application you could make – please pick one. The first type of application is for a Guaranteed Place. In a nutshell, this is the fast track application process. We recognize that people may wish to attend from a significant distance away, either in the British Isles or from a different country entirely, who need to have certainty much faster so they can book hotels and make various (and no doubt complex) plans. Hence, if you are more than a couple of hours drive away from Yorkshire, or live way out from any regular train access to Hull (etc. ), you may apply for a Guaranteed Place. The process is exactly the same as the one outlined below for a Regular Allocation, but instead of waiting until after the regular 1st May 2017 deadline to find out if you have a place, you will hear back from us much earlier (within a day or two if at all possible). We aim to confirm your participation immediately after checking your application form, army list, photographs (etc. ), and you may proceed directly to payment to secure the place. We will allocate as many Guaranteed Places to as many applicants who can justify to us why they should receive one, up to the maximum (we have no fixed lower or upper limit on these places, but we seek to retain the Regular Allocation as much as feasible). The primary condition for allocating Guaranteed Places is distance away, although we reserve the right to modify this and judge applications on a case-by-case basis. You may submit your application to us any time up to 1st May 2017 to try to gain a Guaranteed Place. Again, we will endeavour to inform you whether this has been successful, or whether you have been entered in to the Regular Allocation pool as soon as possible after receiving your application. All that said, you are strongly advised in no uncertain terms to wait to book hotels and travel until we count 10 or more applications in the bag since we will cancel the event if there are less than 10 players coming! (Either that or take out cancellation insurance of your own). A counter has been placed on the right hand column of the blog to give you a live update of applications for this purpose. For the Regular Allocation, the deadline to receive all applications is 23:59 on May 1st 2017 (British Summer Time). Once all Regular Allocation applications have been received the organizers will review all of them and select the participants that they wish to see at the event to fill up the remaining places. No discussion will be entered in to about this selection. The selected participants will then be notified and will be asked to confirm their continued interest. We will proceed to payment within one week of this. Details of how to pay will be provided only to selected participants and will be done via PayPal. Failure to pay will result in a selected participant’s place being allocated to the next preferred player on our list. In the event that fewer than 10 people apply (or Nurgle strikes the organizers down with some terrible sickness, or similar), we reserve the right cancel the event. If this becomes necessary, an email notification will be sent to all applicants and a posting made on Warpstone Flux. Take no action to book hotels for your stay (etc.) until your place has been confirmed with us and we confirm successful receipt of payment from you. (1) Your (legal) name. If you prefer to be called by a different name, let us know this too. If you have a “screen name” (such as “jabberjabber”) that you would like to be displayed in place of your name on our media outlet sites, let us know this too. (2) Your age. This confirms to us that you are at or above 18 years old. We reserve the right to check this on the days of the tournament. (3) Your home address, including country. In case we need to post anything to you or the venue has legal recourse against you. (4) Your email address. This must be the same as the account that you send your application from. We will use this to contact you about the outcome of the application. (5) Whether you are seeking a Guaranteed Place or want to just go in to the Regular Allocation. You should justify a Guaranteed Place application to us in fewer than 200 words please. (6) Your army list. Please supply this as the IMAGE output from Battle Scribe (i.e. preferably a single jpg file. HTML files are also acceptable). (7) Photographs. To help decide which applicants will participate in the tournament if we have more than 20 applicants, we invite all applicants to submit up to 5 photographs of the army that they intend to use. Please try to keep each individual image to 1Mb or less if possible. If unpainted, please note this. If unassembled or not yet purchased, please note this as well. Again, we emphasize that in the event of more applications being received than we have places available, these photographs may be used to try to decide a ranking between applicants. (8) Anything else! Seriously, if there’s anything else that you think we should know about you or your army to help us decide if we should pick you for participation, then let us know. Two hundred words maximum. Give us the elevator pitch, not the essay. Staff House Building, University of Hull, Cottingham Road, Hull. HU6 7RX. U.K.
A map of the university can be found here, along with directions along key routes to the site. Please pay particular attention to parking restrictions in and around the university campus if you are driving here and intend to park during the day. A private company ensures enforcement, even on weekends. Beware! June 3rd and 4th 2017. The organizers will be on site from 08:30 to 17:00 each day. The organizers will be on site from 08:30 on Saturday morning to undertake setting up. On Saturday, we will aim to play 2 games and have the painting judged for the tournament. Registration starts at 9:30am. If you do happen to arrive earlier, then you are welcome to say hello to us and register early if we are set-up. The organizers will give a brief introduction before play begins. All subsequent times below are to be taken as indicative only. Game 1: 10:00 to 12:30. Lunch Break & Armies on Parade / Painting judging: 12:30 to 14:00. Lunch is not provided today, so we will more than likely adjourn to the pub over the road. Game 2: 13:45 to 16:15. Painting Awards: 16:20 to 16:40. Tear Down then commences promptly with the necessary goal of vacating the premises by 17:00. The organizers will again be on site from 08:30 on Sunday morning to commence the set-up. Sunday will aim for a slighter faster play initially to fit in three matches for the day. Game 3: 09:00 to 11:15. If you and your opponent show up early and the allocated table is all set and ready to go, you are welcome to start your game early. Game 4: 11:30 to 13:45. Lunch today will be provided as a buffet – dine and play at the tables during this game. Alternatively, we may order in food on the day. Regardless: don’t spill anything on the gaming boards for goodness sake! That just makes everyone upset. If you eat whilst playing, do so at least half a metre away from the table! Game 5: 14:00 to 16:30. Tournament Awards and Plenary: 16:30 to 16:45. Tear Down will then commence with the necessary goal of vacating the venue by 17:00. Maximum number of players = 20. Minimum age requirement = 18. Ticket Price = GBP 50. This fee is not refundable. It is payable upon successful application to the tournament (see application details, above). Ticket Price includes and will help pay for part of: venue hire, public liability insurance, terrain, and the buffet lunch on Sunday. The maximum points value for each game is 2250. Rationale: this value has been chosen to enable games to be completed in two-and-a-quarter to two-and-a-half hours, and to ensure players have access to most of the miniatures they might wish to deploy. Armies must be constructed using an Age of Darkness Force Organization Chart comprising a legal primary detachment (i.e. Maximum of 3 HQs, 6 Troops, 3 Elites, 3 Fast Attack, 3 Heavy Support, and a single optional Lords of War; Minimum of 1 HQ and 2 Troops). Instead of taking a Lords of War option, a player may instead elect to take a legal Allied Detachment (Maximum of 1 HQ, 2 Troops, 1 Elites, 1 Fast Attack, and 1 Heavy Support; Minimum of 1 HQ and 1 Troops). An allied detachment must be chosen from a different 30k faction or legion to the primary detachment. In the case of Word Bearers or Traitor Auxillia, these can be chosen from Codex: Chaos Daemons with the strict caveat that summoning additional daemons is not permitted by any means. Additionally, for daemons selected as allies, no named (or unique) character can be selected. Players can spend up to a maximum of 25% of their points (explicitly: 563 points) on a Lords of War option. Players can spend up to a maximum of one third of their points (explicitly: 750 points) on an allied detachment. No war machine detachments are permitted (explicitly: detachments that are made up entirely from units with armour values, excepting for Questoris Knights). Primarchs are permitted. If selected, they are automatically the Warlord for the army. Rites of War are permitted. These must be noted in the submitted army lists. Relics of the Dark Age of Technology are not permitted. Shattered Legions are not permitted. Knights Errant and Talons of the Emperor are permitted. Only units in the Horus Heresy and appropriate models may be used. See below for modelling details. Please email us directly if there are any questions or ambiguity, or even if there are items that are legal by the above restrictions but not explicitly mentioned. Please prepare all army lists using the most up to date version of Battle Scribe. They should be submitted to the tournament organizer upon application as the IMAGE output from Battle Scribe and a copy brought with you to the tournament. The most recent Warhammer 40,000 FAQ and rulebook, as at May 1st 2017, will govern the tournament. All miniatures used must be appropriately based, and painted with a minimum of three colours. Bases need not be flocked, or painted (or similar), but we look favourably on entrants with such attention to detail. Indeed, in the event of more applicants than we have places for in the tournament, we will preferentially give places to higher quality painted, and based, armies during the allocation process after 1st May 2017 (as judged by ourselves – no discussion will be entered in to). Armies have to represent their equipment on the models. The tournament will be using WYSIWYG with respect to visible wargear as much as is practicable. Conversions are permitted within reason, but it is expected that the core of every single model will be one produced by Games Workshop, or Forge World (or their licensees). Third party bits, and scratch-builds, are acceptable so long as they fit within the aesthetic of the tournament and look like they fit in the Warhammer 30,000 Universe. If in doubt, please email the organizers. Miniatures that are wholly from third parties will generally not be acceptable. Rogal Dorn (any appropriate miniature on a 40mm base will suffice). Alpharius (any appropriate miniature on a 40mm base will suffice). Magnus the Red (any appropriate miniature on a 40mm base will suffice, or the plastic Magnus model from Games Workshop may also be used). If a player wishes to use another named character that has never been produced or only produced in limited or hard-to-obtain runs (e.g., Autilon Skorr of the Alpha Legion), then a proxy or conversion replacement is also fine. Be sure to let your opponents know as well. All terrain will be defined and placed by the tournament organizers. Players shall not alter or move the terrain intentionally. In the event of terrain being “destroyed”, players should simply make a note of this and call the organizer over to remove the terrain piece in question. Every game will feature one primary mission, two secondary missions and two tertiary missions. Success on a primary mission will give a player 9 tournament points. A Tie on the primary mission (where applicable) will give each player 5 tournament points. Success on a secondary mission will give a player 4 tournament points per secondary. Success on a tertiary mission will give a player 1 tournament point per tertiary. Annihilation (defined as the complete wipe out, or immobilization, of all enemy units; also variously referred to as a “massacre victory”) results in an automatic success for all missions and a single bonus tournament point. i.e. an annihilation victory is worth 9 + 4x2 + 1x2 +1 = 20 tournament points. It is possible for opponents to still score tournament points from secondary and tertiary missions despite being annihilated, but they may never score tournament points on a primary mission objective if they are annihilated. Note that even if a player fails to gain the primary victory, they might actually still outscore their opponent on tournament points by securing both secondaries and tertiaries and ensuring that their opponent fails to do likewise! It is always worth playing on and accumulating the most tournament points in each game even if the tide seems to be going against you. The Best General award will be determined on these points alone. The theoretical maximum is 100 tournament points. All games are limited to 5 turns only. The only exception to this is if an army has a specific rule in play that allows for longer games and there is time available (e.g., Iron Warriors and Imperial Fists both have “The Bitter End” rule that would allow for a 6th turn to be played if there is time available). The organizers will attempt notify the players in the room when they have ten minutes remaining. The current player’s turn should be the last turn of the game at this point in time. At two minutes remaining, the organizers expect play to cease and the winner to be calculated from the current board position, the results notified to the organizers, and tidy-up to commence. Brisk play is expected from all participants as much as possible. Deployment for each game is tied to the gaming board, rather than the mission. Please consult the information sheet that will be left on the gaming table for this. We will only be using: Clash of the Line, Dawn of War, Search and Destroy, Vanguard Strike, and Hammer and Anvil. Players must roll off to determine who deploys first. The winner of the roll decides. The winner of the roll also elects to go first or second after deployment has happened. Seizing the initiative comes after this step. Below, each game is given in detail, including all primaries, secondaries and tertiaries. Due to some repeats in secondaries and tertiaries, we detail the victory condition for these objectives below the game details. All of the primaries have been selected from the Horus Heresy series of books and adapted for this tournament where required. Primary = Blood Feud. The tournament points for this primary mission are based on a scoring system within the game. For each unit destroyed that is classed as infantry or jump infantry, the player gains two points. Anything else is worth one point (in the case of vehicles, they must be at least wrecked, not just immobilized, to count). The maximum points possible here is deemed to be 16. If the minimum possible is under 8, then double points are applied. The winner is the player with the most points scored in this manner. Secondaries = Primary Target, Table Quarters. Tertiaries = Last Man Standing, First Strike. Primary = Tide of Carnage. Each sector of the board is worth a number of points for the side that controls it at the end of the battle. 3 points for one’s own deployment zone, 7 points for the enemy’s deployment zone, and 5 points for no man’s land in between. The most points here gain the primary victory for the player. This means that this particular game should never be a draw. Secondaries = Slay the Warlord, Last Man Standing. Tertiaries = First Strike, Line Breaker. Special Rules: All vehicles with the “tank” type, and “super heavy” ground vehicles or walkers are scoring units in this game. Night Fighting is used on Turn 1 of this game. Primary = Dominion. Before deployment, place d3+2 objectives on to the board, each inside or touching their own terrain piece and 12” away from a table edge if feasible. The player to control the most objectives at the end of the games claims victory. Secondaries = Slay the Warlord, Attrition. Tertiaries = Line Breaker, Table Quarters. (A single unit can only claim one of these two objectives at the end of the game). Primary = Challenge. WARNING: THIS GAME INCLUDES A CONDITION FOR INSTANT VICTORY. Instant (annihilation level) victory is achieved if one player’s warlord slays the enemy warlord through any means (but preferably by sweeping advance if only for narrative sake!). Fleeing off the board does not count, nor does perils of the warp. They must die by the hands of the enemy warlord. The game automatically ends at this point if the condition is met and no more play is undertaken. If such an event fails to happen, then the primary mission is settled on Attrition. Secondaries = First Strike, Line Breaker. Tertiaries = Swept before Us, Storm of Shells. Primary = Onslaught. This game uses a “staged” deployment. Alternate placing your units in the following order: Lords of War, Heavy Support, Troops, Elites, HQs, Fast Attack. After deployment, including infiltrators and any scout moves, each player must place an objective in their opponent’s deployment zone at least 6” from any table edge. The winner of this primary mission is determined on points such that: 5 points are scored for each objective controlled at the end of the game, and 1 point is scored for each unit destroyed in turn 1. Tertiaries = Primary Target, One Must Fall. Slay the Warlord. This mission is successful if the enemy warlord is killed. Routing off the board does not count! First Strike. This mission is successful if the player kills an enemy unit on their first turn. Table Quarters. If the player controls more quarters of the table than their opponent at the end of the game, then this mission is successful. Line Breaker. This mission is successful if a player has one of their units in the enemy deployment zone at the end of the game. That unit must not be immobile or fleeing. Last Man Standing. The side with the greatest number of surviving units (not fleeing or immobilized) gains this mission at the end of the game. In the event of a tie, both sides gain the tournament points. Attrition. To succeed, the player must destroy or immobilize more units of the enemy than they do of theirs. In the event of a tie, both sides gain the tournament points. Primary target. The most expensive unit (in terms of points value) should be noted to the opponent. To succeed, a player must destroy or immobilize this unit by the end of the game. One must fall. The second most expensive character model (or vehicle if there are no character models) in terms of points value should be noted to the opponent. To succeed, a player must destroy or immobilize this unit by the end of the game. Swept Before Us. To succeed, the player must destroy (or immobilize) two (or more) enemy units in close combat, including by use of sweeping advance. Storm of Shells. To succeed, the player must destroy (or immobilize) two (or more) enemy units using ranged weapons. There are a number of awards up for grabs at this tournament. There are no cash prizes though – this is all for honour, kudos and bragging rights. Best General (most tournament points in games only – maximum possible is 100). Best Overall (tournament points in games plus painting plus sportsmanship – maximum possible is 150). Best Player (as voted by other players). Best Painted Army (as judged by the organizers or a “guest judge”). Best Painted Single Miniature (as judged by the organizers or a “guest judge”). Painting scores contributed to “Best Overall” category will be awarded as follows by the tournament organizers during the “Armies on Parade” session on Day 1. 5 points: Every miniature has at least 3 colours. 5 points: Every miniature has a base that has received quality attention. 5 points: Notable conversions or kit-bashing is present. 5 points: Every miniature has a high painting standard. 5 points: The X-factor is present. Something above and beyond what we’ve commonly seen. We don’t know what it is, we can’t define it, but we think we will know it if we see it. Alternatively, players may self-report themselves to have zero points here as they used a painting service, or commissioned army. Let us be candid. We have no real way of knowing if players did the painting themselves or whether they used a commission service. We therefore rely on players self-reporting whether they used a painting service, or commission, for their works. Obviously, this is open to abuse, but the lack of any substantive cash prize or giveaway coupled with the maturity of players attending should be a partial barrier to this. Sportsmanship will be dealt with in two ways. For each game, players will submit a “thumbs up” or “thumbs down” report on sportsmanship. The default expectation is that everyone would receive a “thumbs up” in every game. The criteria for giving a “thumbs down” is due to abusive behaviour, or obvious stalling (i.e. taking exceptionally slow turns or wanting to look almost every minor detail up in the rules book), or showing up in an unfit state to play (e.g. drunk). The organizers will terminate the participation of anyone receiving thumbs down on the grounds of abusive behaviour or inebriation. Multiple thumbs down on the grounds of playing slowly, or extensive rules lawyering, will result in forfeiture of tournament points, or similar, at the discretion of the organizers. We have no desire to implement these sanctions whatsoever and therefore ask all participants to play accordingly. At the end of Game 5, each player will be asked to nominate his or her favourite player that they faced. Each nomination received will be awarded 5 points that will contribute directly to the “Best Overall” award category. This means that the theoretical maximum score for “Best Overall” is 150 (100 points from games, 25 points from painting, 25 points from sportsmanship). Note there will be no points awarded for army construction, or army “power level” (or lack thereof). In Horus Heresy gaming, we expect that players will create thematically appropriate lists and, in doing so, trust to the game designers that the points levels are approximately balanced out. That said, we discourage “win at all costs” lists informally, but welcome strong, competitive lists that are well themed and contain a diversity of units. As an example: multiple land raider tanks containing nothing but terminators (and maybe a primarch) are to be discouraged. On the other hand, a strong White Scars build featuring many bikes, javelins, land speeders with multiple aerial support components and potentially coupled with plenty of plasma weapons is very thematic and to be applauded, even if it is a list that you would personally find tough to play against. Entry to the tournament gives the organizers the rights to take pictures of the event, including entries in the painting competition, to use and publish as they see fit. Other players are similarly welcome to take pictures of the event. The games are expected to be self-regulating by the players involved. Army lists should be exchanged before the game commences and if there’s anything unclear, then the players should clarify with each other what the source of uncertainty is. The primary concern is that players have a quality experience that is free from any type of discriminatory (verbal or otherwise) behaviour. In the event of a rule not being known, we expect the matter to be randomly determined, or the “fluffiest” direction be taken. If a rules question arises that players would like an adjudication of, the organizers would be happy to attempt such adjudication. However, given that time might be tight, the organizers will more than likely roll a die on behalf of the players to settle any such matters. All decisions (right or wrong) given by the organizers are final and no future discussion will be entered in to. Whilst the tournament does contain a strong aspect of competitive play, our primary concern remains for all players to have fun, and a great experience. We therefore ask for an appropriate level of maturity from our players. We reserve the right to alter any or all of the above. Pubic liability insurance will be taken out for this event by the organizers. This covers our own equipment (i.e. gaming mats, terrain). The venue has similar insurance for the equipment that they provide (i.e. tables, chairs). In the event we cancel the tournament, we will refund all tickets that have already bought guaranteed places. We ask that such ticket holders do not book flights, trains, (etc.) or hotels before we confirm we have 10 or more participants able to attend (10 being the minimum number at which we regard this event as being viable). We will let you know through the blog and Facebook when this threshold has been met. We will attempt to settle amicably any dispute that might arise. In the event of serious dispute that cannot be settle amicably, we reserve our rights as a business entity (Sequestered Industries) to have matters settled in any appropriate manner. The same is true of the venue hosts we are using. By purchasing a ticket to this event, you guarantee that you are over the age of 18 and have read the above documentation. This includes the fact that we cannot offer refunds once tickets are purchased – by purchasing a ticket, you agree that you understand this condition. Players who take part agree to have photographs taken of their miniatures and posted in our media outlets.